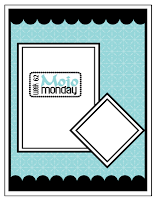 I had some time to play with Julee's Mojo Monday sketch #62. Anytime I see a sketch with scallops, I get all giddy. I know that I can add scallops to a card anytime, but I especially love to see them on a sketch! 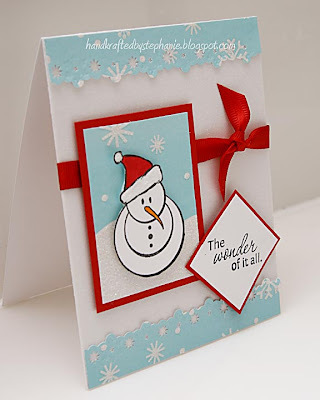 This card will also double as my card for this week's OCC challenge, to incorporate snowmen and/or snowflakes on your card or project. It's hard to see the glitter in the photograph. The background white is actually all glittered, as are the snowflakes and snow on the light blue pp, plus I added glitter to the snowman's hat. Cardstock: PTI; Patterned paper: MAMBI, DCWV winter stack; Stamps: Verve; Ink: Memento Tuxedo Black; Copic markers; Martha Stewart border punch; Other: ribbon, foam tape. Fabulous card! I love your snowy scene behind the snowman. Thanks for playing! Perfect, I love red and aqua together you rock.